Rohn is one lucky hunter! 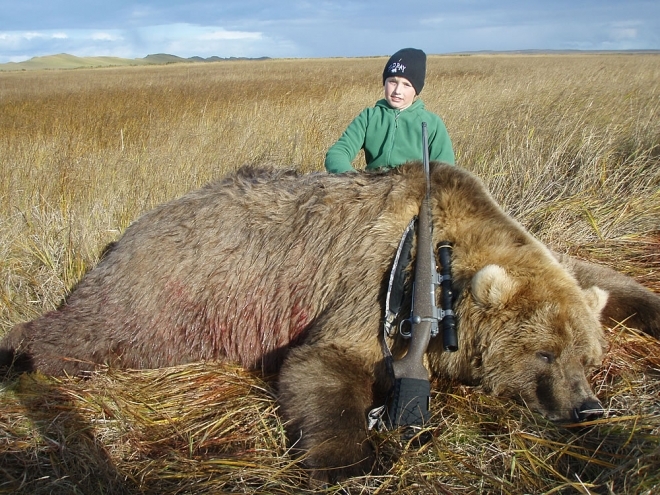 At ten years old Rohn applied for Unimak Island and remarkably drew a fall Unimak Island Brown Bear Permit on his first try. This was Rohn’s first Alaskan big game hunt and he handled it like he’d done it many times before. Rohn’s experience included two different campsites and a few different stalks on trophy bears. Finally a stalk went in favor of Rohn and he harvested this impressive 9’6” brown bear. As you can see in the photo Rohn’s one happy hunter. Way to go Rohn!